WEDNESDAY, July 30, 2014 (HealthDay News) -- Older people with depression are more likely to develop dementia, but researchers have been unable to explain the exact nature of the relationship between the two. Specifically, they haven't been able to figure out the direction in which the relationship works -- does depression help bring on dementia, or does dementia cause people to become depressed? A new study published online July 30 in the journal Neurology sheds more light on the mystery. Depression is a risk factor for dementia, researchers report, and people with more symptoms of depression tend to suffer a more rapid decline in thinking and memory skills. While the study found an association between the two, it did not prove a cause-and-effect relationship. Depression accounted for about 4.4 percent of the difference in mental decline that could not be attributed to dementia-related damage found in the brain, the researchers said. "This is a risk factor we should take seriously," said lead author Robert Wilson, senior neuropsychologist at the Rush Alzheimer's Disease Center at Rush University. "Treating depression can reduce the risk of dementia in older people." The study involved over 1,700 people, with an average age of 77, who had no thinking or memory problems at the start of the study. 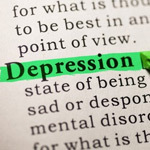 Participants were screened every year for symptoms of depression, such as loneliness and lack of appetite, and took tests on their thinking and memory skills for an average of eight years. During the study, about half of the participants developed mild problems with memory and thinking abilities that often appear as a precursor to Alzheimer's disease. A total of 315 people, or 18 percent, developed dementia. A total of 680 people died during the study, and autopsies were performed on 582 of them to look for the plaques and tangles in the brain that are the signs of dementia and other signs of damage in the brain. The investigators found that high levels of depression prior to a diagnosis of dementia are linked to a more drastic decrease in thinking and memory skills later on. On the other hand, onset of dementia did not seem to be associated with an increase in depression. In fact, the opposite appeared to be true. "We found that people who are developing dementia did not become more depressed as they developed dementia, they actually became less depressed," Wilson said. "As people lose their thinking and memory skills, it becomes harder to become depressed and stay depressed," he continued. "Depression depends on a certain continuity of experience that becomes disrupted as you develop dementia. It's left to the rest of us to feel depressed as we watch our loved ones slip into dementia." However, the researchers found no relationship between depression and dementia-related damage in the brain. That could mean that treating depression will only stave off a portion of the thinking and memory decline that occurs with age, said Dr. Alan Manevitz, a clinical psychiatrist at Lenox Hill Hospital in New York City. "Clearly, attending to depression during one's life, just like exercise or eating right, will lead to at least deferring some of the mental decline that comes with aging," Manevitz said. "Also, if you treat depressive symptoms, you may be able to reverse some part of the decline that's related to the depression." Future research now should pivot to determining exactly how depression influences the risk of dementia, Wilson said. "We must try to identify structures and functions in the brain that are linked to depression in old age and could help explain depression's link to dementia," he said. "That gives us a better chance of knowing how we should best treat depression in a way that will move the bar and reduce risk of dementia."